Colorado is a battleground in the war to control the U.S. Senate. Follow the money backing Democratic Sen. Mark Udall, and you begin to see some interesting alliances – an industry lobby, an environmentalist group, and the Democratic leadership. Tom Kiernan is CEO of the American Wind Energy Association – the main lobby group for the wind industry. Kiernan is also the treasurer of the League of Conservation Voters, a politically active non-profit, and sits on LCV’s board. Integrating the non-profit groups like LCV with the industry lobbies like AWEA was a chief goal Kiernan brought to AWEA. Here’s one way to understand that line: strong wind subsidies and strong wind profits go hand in hand. Kiernan isn’t the only connection between the groups. Wind investor Peter Mandelstam sat on AWEA’s board and LCV’s board simultaneously, until he left AWEA’s board last year. For seven years, Mandelstam chaired AWEA’s Offshore Group. Both groups are playing in competitive Senate races this year, specifically Iowa and Colorado. The ads the two groups are running of are very different flavors. AWEA’s ads are technically issue ads – that is, they don’t explicitly advocate the election or defeat of a candidate. 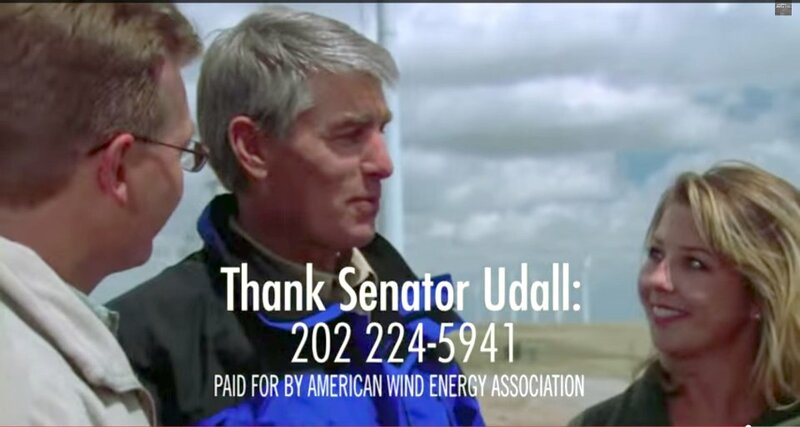 “Thank Senator Udall,” the text on the screen reads. AWEA officials explain that this isn’t a campaign ad, but of course it ran in the first weeks of the general election (four weeks after Rep. Cory Gardner won the GOP primary). At the same time, AWEA launched an ad telling Iowa voters to call Rep. Bruce Braley, D-Iowa – Braley happens to be the Democratic nominee for Senate there. Making sure to be bipartisan, AWEA’s first round of ads also included one applauding Republican Sen. Chuck Grassley, who is not up for reelection this year. LCV is technically a non-partisan organization. LCV spokesman Daniel Weiss points out that the organization’s political arm is supporting liberal Sen. Susan Collins – who leads her opponent by 30 points and hardly needs the help. LCV is also playing in the Iowa race, playing its part in a $1 million green-group effort against Republican Joni Ernst – while AWEA touts her opponent Braley. So LCV and AWEA have quite the overlap in politics and personnel. AWEA is the nice guy and the industry representative. LCV is the attack dog and the environmentalist non-profit. LCV also has an interesting overlap with the Democratic Party. LCV’s board included Obama confidant John Podesta, until Podesta joined the Obama White House as a counselor. LCV’s 501(c)3 has paid $1.3 million to Waterfront Strategies for producing tv and web ads, and buying airtime for them. The League of Conservation Voters Action Fund (the group’s PAC) and the League of Conservation Voters Victory Fund (the group’s SuperPAC) have both hired Waterfront Strategies, too, as has the Michigan League of Conservation Voters, according to FEC filings. Waterfront’s two biggest clients, judging by a perusal of FEC filings, are the Senate Majority PAC and the House Majority PAC – Democratic SuperPACs that are effectively controlled by the party leadership. Clearly, then, AWEA and LCV have their political and personal overlaps. LCV and the Democratic leadership also have their political and personal overlaps. Nothing here looks illegal. But most people probably think of LCV as a grassroots organization of motivated environmentalists. They might be surprised to see how closely it stands next to an industry lobby and a political party.